Can Snoring Cause Behavior Problems in Children? The journal Pediatrics, published by the American Academy of Pediatrics, included an article in its March issue that is not only gaining publicity but also causing concern and confusion among parents. 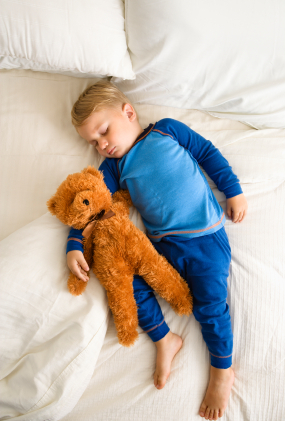 The study showed that children with difﬁculties breathing during the night had anincreased incidence of hyperactivity, behavior problems, conduct disorder, peerdifﬁculties and emotional issues when compared to children who get a more restful sleep. When medical news is reported on television or over the internet, it’s important to have the original research article at hand and be aware of all the details. Never the less, parents are naturally going to apply any publicized symptoms to their own children which then sets off a wave of panic. Let me begin by saying that most babies are noisy breathers and parents are more aware of it during the silence of the night. Also, it’s common for newborns to have what we call laryngomalacia, which is an immaturity of the structures of the larynx. This causes vibrations and noise while eating and during activity. This is normal behavior that does not require any intervention. In regards to infants making noise while they sleep, that does not always mean there’s a problem. The previously discussed study was based on children who suffer from what we call “sleep disordered breathing” (SDB). This is not the mild purr of a newborn or the restless sleep of a toddler. When children have SDB their snoring can be heard from across the room; Breathing occurs through the mouth and there are often pauses that may last several seconds. How can difﬁculty breathing cause behavior problems later on? The answer is simple: Children who suffer from SDB don’t take in enough oxygen during the night due to an obstruction in air ﬂow, usually from enlarged tonsils or adenoids. When they don’t take in enough oxygen, sleeping time does not exert its restorative effect in the body and it ends up affecting the brain. The prefrontal area of the brain (which has to do with control of impulses and attention) ultimately does not develop properly therefore causing the hyperactivity, inattention or poor impulse control. A couple of generations ago a large number of children underwent tonsillectomies (removal of the tonsils) and/or adenoidectomies (removal of the adenoids) when they were considered to be too large or were frequently getting infected. Over the last decade the number of tonsillectomies and adenoidectomies has signiﬁcantly decreased, mainly due to the concern that the tissue to be removed is there for a reason and plays an important function in preventing infections. The tonsils and adenoids are located around the upper airway (the mouth and the nose) because their function is to protect against infections entering through the nose and the mouth. Pediatricians and Ear-Nose-and-Throat Specialists must consider the advantages and disadvantages when recommending the removal of an organ tissue that nature intended to be there for a reason: to protect against infection. When the tonsils and adenoids are creating problems and interfering with a function as important as breathing, removing them makes all the sense in the world. The message here is for parents to share concerns with their child’s doctor and together decide the right plan to follow. Every case is different and the treatment recommendations must be individualized. Be aware, get informed and consult the experts.